Words by Kevin Doocey on September 11, 2009 . 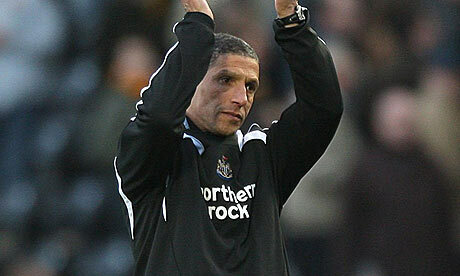 A huge amount of credit is due to manager Chris Hughton as he has worked without one complaint, under sever conditions at Newcastle. The Irishman who was initially hired as an assistant for Kevin Keegan, in in his second term as temporary manager and he’s loving every minute of it, to say the least. And why wouldn’t he? Top of the table, playing good football and attracting on average, 40,000 Geordies to St.James’ Park each home game. Most Premier League mangers can’t boast the same as Chris Hughton has, and he received manager of the month, officially, a day ago. Every Toon fan would’ve picked anyone but Chris to take charge of first team affairs after Alan Shearer left but amidst all the confusion, Chris has trained the lads well, and the pre-season trip to Ireland was a massive bonding event which is paying dividend now. Steven Taylor mentioned before the start of the season how much the trip had bonded the players and boosted their morale but you can clearly see this in their performances and in one player above all, Shola Ameobi. The future Nigerian international striker has banged in a fair share of goals so far, but injury rules him out of the next two ties. Chris deserves the Manager of the Month accolade that he has received and he can be very pleased with himself, it wouldn’t surprise me if he becomes a full-time manager soon rather than later, whether it’s at Newcastle or elsewhere, remains to be seen. A word of thanks Chris and Colin Calderwood for all you’ve done so far.